Short Description AdBlue Digital is an ad network that works with a great amount of publishers and biggest advertising platforms, which allows to reach unique inventory in over 190 countries. If you need branding or you are looking for clicks, installs or actions - we can help to run an effective campaign and reach high ROI. Adblue Digital has developed unique algorithms of optimization that show great results. Advertisers have an opportunity to use different targeting such as locations, careers, devices, channels, auditory, day part and many others. Assigned manager helps to set up and optimize ad campaigns. Our network offers beneficial mobile packages, which are created for quick an easy set up of the campaign. Advertisers can choose countries, volumes and set up the necessary targeting. Short Description Epom Market is an international advertising network which connects top Publishers with premium Advertisers in over 180 countries and across all verticals. Epom Market is a cross-platform advertising network, working with a wide range of display, mobile web, mobile app, and video ad formats in one unified, 100% transparent ad exchange. Marketplace clients can sell their ad inventory at the best rates, use precise targeting features, and benefit from automatic eCPM campaign and placement optimization. Short Description AppsUnion is a high performance, leading pioneers in mobile marketing.Headquartered in Hongkong, with offices in China, India,Indonesia, and presence in USA ,we aim to help our partners achieve global coverage. Feel free to request coopration with our coopration BD. Short Description GoWide is providing a Global Mobile Inventory converted to results! Portfolio of mobile app traffic solutions for app owners and developers, affiliate marketers and advertising agencies! Created by marketers and for marketers, GoWide will consolidate all your advertising efforts in one place and deliver stellar ROI results. Short Description Go2mobi has been delivering proprietary technologies that media buyers love. Our first platform, the industry renowned Go2mobi Tracker, was such a hit that we took all the best parts (like ultra-granular reporting and industry-leading optimization) and developed the Go2mobi Mobile Audience Targeting Platform, the most targeted mobile ad network in the world. Short Description MassiveImpact (www.massiveimpact.com) is a performance advertising platform focused exclusively on mobile with targeting technology that guarantees advertiser ROI. We generate revenue for advertisers based on a cost-per-action (CPA) business model rather than cost per impression (CPM) or a cost per click (CPC) offered by other mobile advertising providers. MassiveImpact reaches more than 190 countries, generating over 2 billion impressions per month. Advertisers only pay MassiveImpact when there is a conversion event, whether it is an online purchase, a download, a call into their call center or a filled-out online form. Short Description IconPeak specializes in mobile performance advertising and is one of the largest platforms in Europe in just two years. They are a trusted partner to over 300 top developers and advertisers, who offer an inventory of exclusive and in-demand campaigns to ad buyers. Their team currently manages monetization solutions for over 3000 mobile web pages and apps and works with placements from media buying, in-app, native, programmatic and video, as well as a YouTube Influencers program. Finally, they offer support in 22 languages and use their proprietary optimization engine, SmartIcon, to measure, monitor and optimize performance with real-time reporting. Short Description Mobair is a performance-based mobile app marketing platform that provides programmatic solutions for high-quality user acquisition on a large scale. We connect advertisers and publishers worldwide, establishing the ideal conditions for successful promotion and monetization. Short Description Appnext is a leading monetization and app distribution platform, exclusively dedicated to building great mobile businesses by promoting apps. With a growing community of over 30,000 developers, we’ve created a marketplace that connects publishers and advertisers directly and transparently, amplifying their monetization and app distribution efforts. Appnext offers publishers a wide range of development tools catered to their needs, from API to SDK, enabling them to develop native ad promotions, or use a wide variety of predefined advertising units. With top app advertisers on board, we serve over 12 billion app requests per month, in 180 countries, with 350 million users, and dozens of media partners. The Appnext self-serve platform operates on a CPI bidding basis, allowing advertisers to optimize their bids, and laser target their preferred audience. 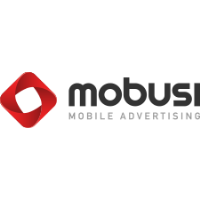 Short Description Mobusi is one of the most valued mobile agencies worldwide, delivering over 140 million mobile clicks a day and generating more than 290,000 daily conversions.